This is my version of typically Italian pasta dish eaten with chopsticks. Yes, very weird but tasty and practical. We just love wide egg noodles, especially the short twisted ones, but they are so difficult to eat with knife and fork so now we always use chopsticks and since there is no knife with table setting all ingredients have to be cut into bite sized pieces. It is that simple, just like any Chinese stir fry. I used chunky and thick tomato sauce with chopped zucchini, onions, garlic and roasted peppers. First, cook noodles of your choice, drain and toss with little butter and olive oil. Set aside and keep warm. 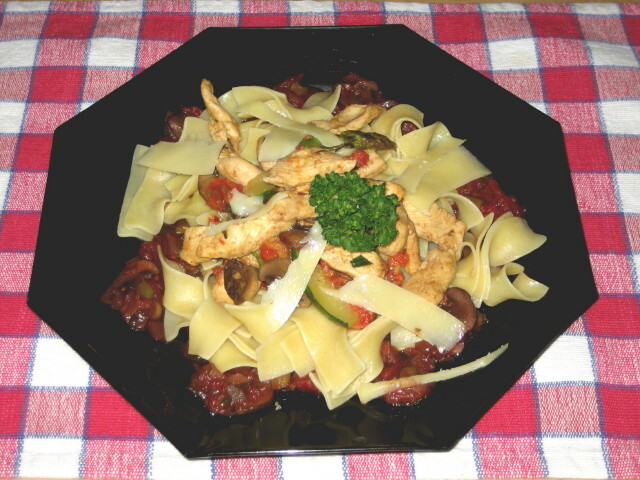 While the noodles are boiling heat up non-stick skillet, add little olive oil and stir fry chicken breast that was cut into small, bite sized strips, together with julienned zucchini, sliced onion and sliced cremini mushrooms. At same time add the sauce, mix and cook till chicken is done, about 2 minutes. Serve noodles on preheated plate, top with chicken, sauce and veggies. That’s it. If you have a sauce ready it takes well under half an hour total.